Speed- This cube has pretty average speed, not the best but not the worst either. Corner Cutting- I feel as if the corner cutting was actually reduced somehow as the cube got older. It cuts maybe 30 to 35 degrees most of the time, but it is very inconsistent and may cut more or less than that sometimes. Reverse cutting is 1/4 of a cubie. Locking- This cube locks up ALOT, probably from the lack of good corner cutting. I get 3-4 pretty major lockups every time I solve, which can slow fast cubers down pretty good. (I am a sub-45 cuber, so it does not affect me that much, but it is still incredibly annoying). Corner Twists- Corner Twists are very minimal on this cube. I have done about 1000 solves and have had 1 or 2 corner twists. Popping- Again, I have done about 1000 solves and have had only 1 pop. Even when it locks up and you try to force it, this cube will not give in. One of the most pop-resistant cubes I have felt before. Overall: I give this cube a 3 star overall review. Corner twists and popping are its strongest points, but corner cutting and locking up are major problems with this cube. Also, right out of the box, this was a great cube. I started using it and it gradually got worse. This is because the lube is dried up. If you keep this cube well lubed, it can be a decent cube. Recommendation: This is definitely a beginner's cube. It worked great as a first speed cube for me, but I am looking better cube as I get more advanced. This an excellent cube for beginners at speed cubing! With corner cutting at approximately 45°, yet it still gets the job done. It has good speed, lubed or unlubed, but lubed would be better. It will never pop, unless you manually pop it yourself, and locking will some times occur if you try to do some rough turning with it. Corner twists won't happen but you can flip it yourself. All in all, its a great cube to use! This cube is a terrifically neutral cube. Nicely fast, and works well. 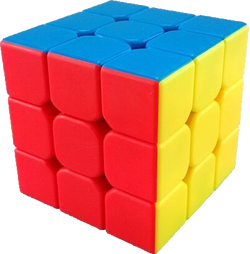 This cube is a good cube for beginners just getting into speedcubing. The feel is crunchy yet smooth and corner twisting is a bit of a problem. Lock-ups are rare and corner cutting is around 30-40 degress. Overall this cube is a great cube, and performs best with lube. I would recomend having quite lose tensions but not so lose that it continuously pops. BUY THIS CUBE!! !